​Bangkok (VNA) – Prime Minister Nguyen Xuan Phuc and his Thai counterpart Prayut Chan-ocha expressed their satisfaction at the strong development of Vietnam-Thailand cooperation over the past 41 years since they established diplomatic ties in August 1976, during their talks in Bangkok on August 17. The two PMs recognised that the bilateral relations have been stable and developed in all fields from politics and security to economy and socio-culture, especially after Vietnam and Thailand established a strategic partnership in 2013. To further the relationship in the coming time, they agreed to enhance all-level delegation exchanges and effectively implement cooperation mechanisms in addition to soon organising the third meeting of the joint committee on bilateral cooperation, the third foreign minister-level meeting, the third meeting of the joint committee on trade, and particularly the fourth joint cabinet meeting. Both sides vowed efforts to raise bilateral trade to 20 billion USD by 2020 and support each other to become centres for investment and trade in the region. They agreed to foster rice-related cooperation and provide favourable conditions for Vietnamese and Thai rice to access each other’s market. 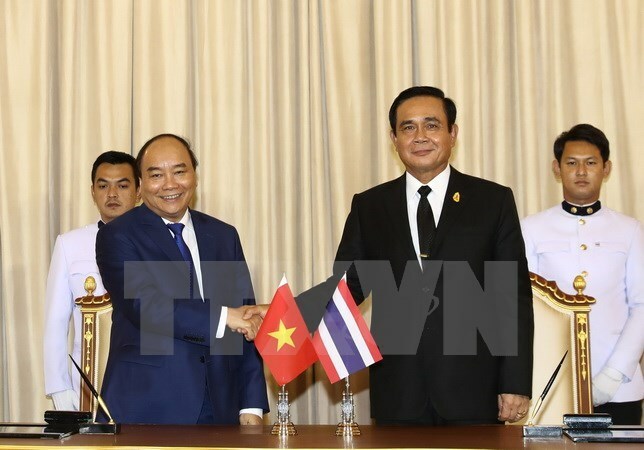 PM Chan-o-cha affirmed that he will encourage Thai businesses to increase investment in fields critical to Vietnam’s development such as tourism, support industries, finance, banking, science-technology, and agro-fisheries. Both leaders stressed that security-defence cooperation is one of the pillard of the Vietnam-Thailand strategic partnership. The two countries will step up sharing defence-related viewpoints and policies while boosting collaboration between their defence arms and services. They also reiterated the commitment of not allowing any individuals or organisations to use this country’s territory to carry out activities sabotaging the other country. The two sides will coordinate in fighting terrorism and crimes, dealing with sea-related issues, and promoting negotiations on agreements on extradition and mutual assistance in criminal matters. They also affirmed the importance of reinforcing cooperation and sharing experience in preventing illegal, unreported and unregulated fishing. The PMs agreed to increase transport connectivity through multiple means, including by road, sea and air, between the two countries and within the Greater Mekong Subregion such as a bus route linking Thailand, Laos and Vietnam, a coastal transport route connecting Thailand, Cambodia and Vietnam, and air routes linking Vietnam and Thailand. They reached a high consensus on working out measures to bolster ties in other spheres like labour, agricultural trade, tourism, science-technique, cultural, and people-to-people exchange. On this occasion, PM Phuc asked Thailand to continue providing optimal conditions for the Vietnamese community in the country to integrate into the local society and develop. He also called on Thailand to soon grant travel documents for old Vietnamese expatriates. At the talks, the two leaders also discussed international and regional issues of mutual concern. They pledged to foster bilateral cooperation at international forums, especially within the framework of the Greater Mekong Subregion, the Ayeyawady-Chao Phraya-Mekong Economic Cooperation Strategy (ACMECS), ASEAN, Asia Cooperation Dialogue, the East-West Economic Corridor, APEC, and the United Nations. PM Chan-o-cha confirmed that he is going to attend the APEC Economic Leaders’ Meeting slated for November in Da Nang city, adding that his country supports Vietnam’s initiatives within the APEC framework. Looking back ASEAN’s 50-year journey, the leaders were glad to see that the ASEAN Community has grown into an important cooperation mechanism for the bloc itself and for countries in and outside the region. PM Phuc highly valued Thailand, one of the founding countries of the grouping, for always maintaining its active role in strategic security and development issues of the ASEAN Community. Meanwhile, PM Chan-o-cha stressed the increasingly dynamic, proactive and responsible role of Vietnam in ASEAN, and expressed his hope that the two countries will continue their close relations within the bloc’s framework and contribute to its common successes. The two sides committed to working closely with each other and with other ASEAN member states to strengthen the bloc’s unity, maintain its stance and promote its centrality in issues that challenge the region’s peace and security. They reiterated the importance of maintaining peace, security and stability as well as navigation safety and freedom in the East Sea. They stressed that parties concerned need to fully and efficiently implement the Declaration on the Conduct of Parties in the East Sea (DOC); build, preserve and improve mutual trust; respect the principles of exercising self-restraint and banning the use of force; address differences and disputes by peaceful means in compliance with international law, including the 1982 UN Convention on the Law of the Sea. The leaders also reaffirmed their support for ASEAN and China to soon have a Code of Conduct in the East Sea (COC). On the occasion, the PMs witnessed the signing of important documents, including an agreement between the two governments on cooperation in science, technology, renovation and creation, and memoranda of understanding between ministries and sectors pertaining to economy, trade, post, telecommunications, information technology and banking, as well as those between localities and businesses.